A romantic comedy – the sequel to Coffee, Tea, The Gypsy & Me, which shot to #3 on Amazon and was E-book of the Week in the Sun. Continuing the Coffee, Tea... series, join Jo and Hattie as they romp into their middle years and prove that anything is possible! Jo remembers her late husband’s words but is struggling to face the lonely future that lies ahead. A heartbroken widow, the love of her life, husband Romany John, has died suddenly and Jo finds herself alone with ghostly memories at Kirkton House - a Cumbrian Manor that until recently, she ran as a thriving hotel. Her two sons have moved away; Jimmy to run a bar in Barbados and Zach, to London to pursue a career as a celebrity chef. Middle-age and widowhood loom frighteningly and Jo determines to sell up and start again, despite protestations from colourful friend, Hattie and erstwhile admirer Pete Parks. Hattie convinces Jo to postpone any life-changing decisions by enjoying a Caribbean holiday in Barbados and their holiday sets off a course of events that brings mayhem and madness to Jo and her family. I’d like to think that dreams help me to write. If a dream has been vivid I make sure that I write it down. Just the process of writing about the dream inspires me to continue writing, I like the dreamy place that it has taken me to where I have searched to recall the dream and commit it to the page. It puts me in a good space mentally to begin my writing session. My last dream was about a man in a quaint cottage in an apple orchard. He invited me in to the welcoming kitchen where beams of sunshine flooded through an open window and shone on a neat row of bottles of freshly made cider. I first started writing five years ago. I never thought I was good enough to put pen to paper and imagined being ridiculed. I’d hated school and only took an interest in English and cookery lessons – two subjects that became the basis of my career to date. I was published a year later and thrilled that the novel shot to #3 in women’s fiction on Amazon – it gave me the encouragement to carry on. I like a happy ending and I like to be entertained and hope that my writing does this. I read many genres from crime and thrillers to historical and romance. All reading is great and I can never have too much of it. Coffee Tea The Caribbean & Me is a book about two friends who find themselves single again in the middle stage of their lives. Jo, a heartbroken widow, is struggling to face the lonely future that lies ahead as she finds herself alone with ghostly memories at Kirkton House, a Cumbrian Manor that until recently, she ran as a thriving hotel. Her two sons have moved away - Jimmy to run a bar in Barbados and Zach to London, to pursue a career as a celebrity chef. 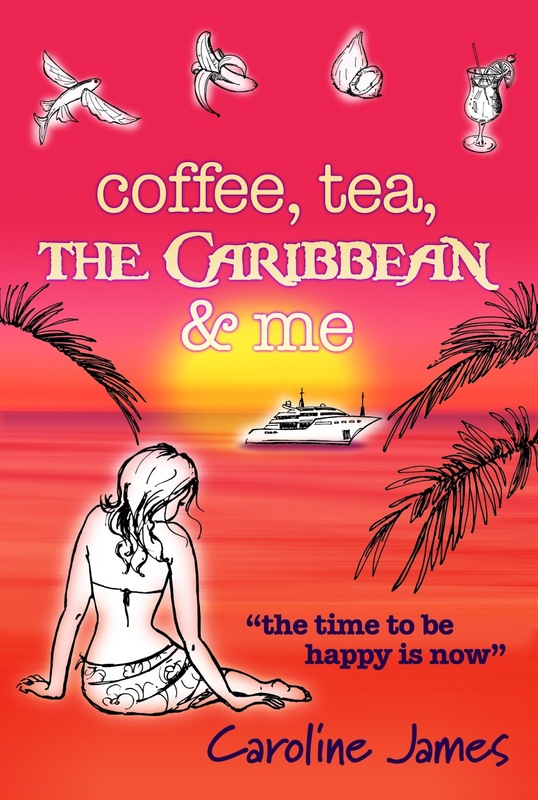 Middle-age and widowhood loom frighteningly and Jo determines to sell up and start again, despite protestations from her colourful friend, Hattie, who convinces Jo to postpone any life-changing decisions by enjoying a Caribbean break in Barbados. Their holiday sets off a course of events that brings mayhem to Jo and her family and she is confused and anxious for her future. The book sets out to show that life really can begin in middle and later years and romance can happen. One in three people in the UK, over the age of fifty, live alone. I wanted to write a book that addresses the issues of how to regain your confidence and have a great time if you suddenly find yourself alone after a relationship breakdown, death or family loss. I wanted to show that life really can begin again and our later years can be the best years of our lives. I went into our local library a while ago and saw someone pick one of my books off the shelf, study the back cover then tuck it away with her other reading choices. It was a lovely moment. A fabulous artist called Alli Smith. I have worked with her on lots of projects over the years and she just seems to ‘get me’. I turn up with indecipherable jottings on a scrap of paper, rambling about my vision and somehow she understands what I want and comes up with the goods every time. She is brilliant. The illustrations in my books are all hers too. Where do you write?I have an old oak desk tucked in the corner of a room. It is quite a dark space but brightly lit with a lamp and is warm, cosy and comfortable. I always wanted to be a writer but never thought I was good enough so that went on a back burner for many years. On holiday as a child I walked along a beach staring at the big hotels on the cliff tops and vowed that one day I would have my own hotel. I achieved both of those dreams. Caroline James was born in Cheshire and wanted to be a writer from an early age. She trained, however, in the catering trade and worked and travelled both at home and abroad. 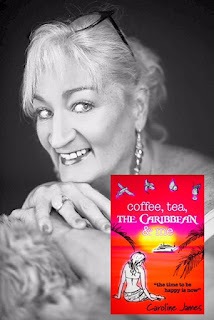 Caroline's debut novel, Coffee Tea The Gypsy & Me shot to #3 on Amazon and was E-book of the Week in The Sun newspaper. Her second novel, So, You Think You're A Celebrity… Chef? 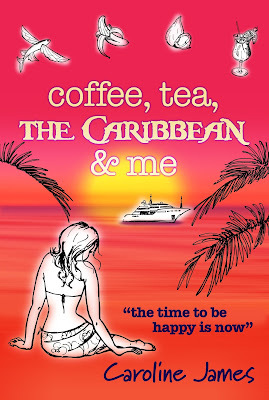 has been described as wickedly funny: 'AbFab meets MasterChef in a Soap…' The manuscript for Coffee Tea The Caribbean & Me was a Top Ten Finalist at The Write Stuff, London Book Fair 2015 and the judge’s comments included: “Caroline is a natural story-teller with a gift for humour in her writing.” Her next novel, Coffee Tea The Boomers & Me will be published autumn 2016. 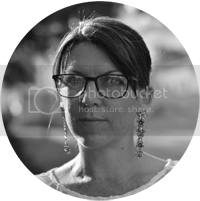 Caroline has owned and run many catering related businesses and cookery is a passion alongside her writing, combining the two with her love of the hospitality industry and romantic fiction. As a media agent, Caroline represented many well-known celebrity chefs and is currently writing a TV script and accompanying book about the life of a well-known chef. She has published short stories and is a member of the RNA and The Society of Authors. Caroline writes articles on food and celebrity based interviews and is Feature Editor for an online lifestyle magazine. When she's not running her hospitality business and writing, Caroline can generally be found with her nose in a book and her hand in a box of chocolates, she also likes to climb mountains and contemplate life.